We first visited Bernat Klein’s Studio almost three years ago, in between exploring various textile mill buildings in the nearby towns. At the time there was no way to get inside so we contented ourselves with taking some exterior photos of the interesting architecture and peering in through the generously proportioned windows. When I heard the studio was to open for visitors on the region’s Doors Open Day 2016, I took advantage of the opportunity to finally explore the inside of it. 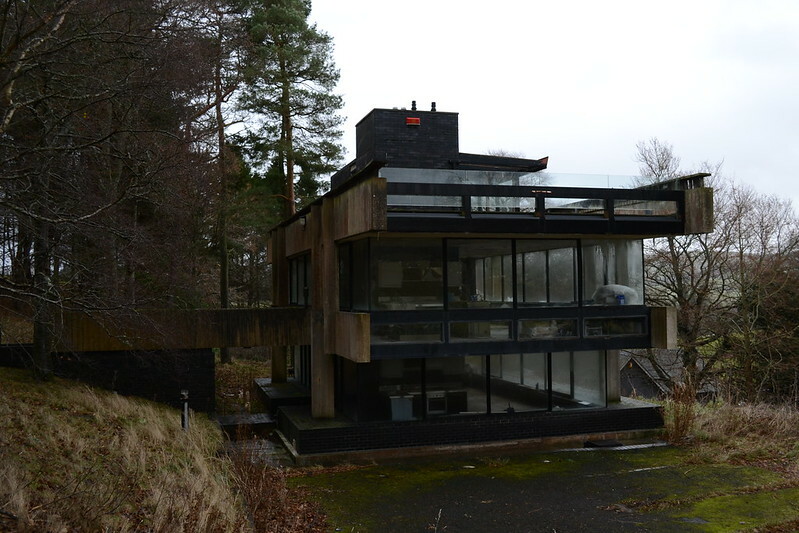 Bernat Klein, a textile designer and painter, commissioned the architect Peter Womersley to build a studio in the countryside of the Borders, a few miles outside Selkirk, in 1972. The two storey building, in modernist style, had an unusual design. 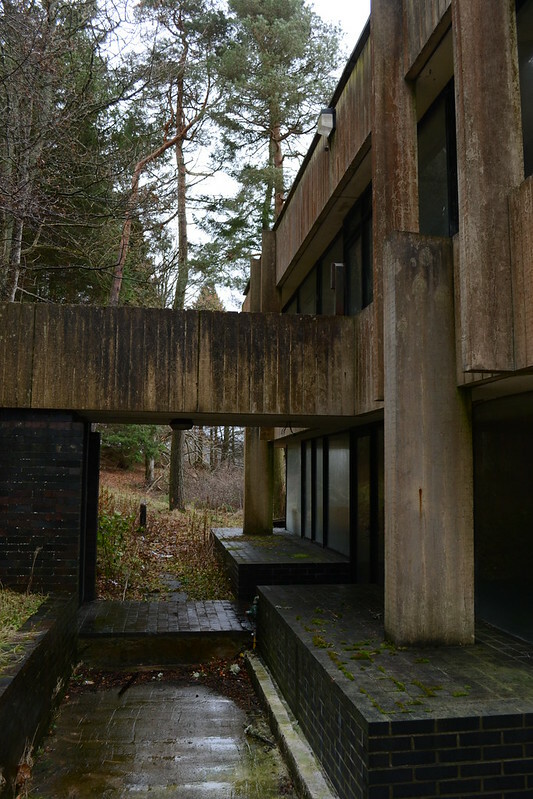 The exterior walls were almost entirely glass, with the concrete in between the windows textured to look almost like wood from a distance, and the upper storey (which had its own entrance across a concrete bridge to the side of the building) being larger than the lower. The studio has been a striking landmark on the road from Selkirk to Peebles ever since, but it’s been empty for several years now. At the start of the new century, the plan was to turn it into a textile interpretation centre, but this fell through. It was acquired by a new owner after this, who has thankfully undone some of the unsympathetic alterations done for the textile centre, though setbacks have continued, including leaks from the roof and from the plumbing system, and the building is still vacant at present. As you’d expect from a building with so many windows, the interior is very light and airy. There is a kitchen at the front of each floor, and an empty space at the back; the intention is that the two levels will be able to function as independent apartments. The central brick pillar of the building encompasses a dingy concrete staircase, and two near-identical bathrooms, which have not fared well. The roof has now been converted into a terrace, which catches the sun nicely on warm days. The plumbing is also all in the central pillar. A gas supply has been added to the building relatively recently, serving these two boilers up at the roof level. It’s not the biggest or the most exciting of buildings, but it is an interesting local landmark, and it was satisfying to finally be able to get a proper look at it. Brilliant! I love this building and always wondered what it looked like inside. Wish I owned it.